At Cornell, where I am currently an ABD struggling to finish a dissertation, there is a program known as the First-Year Writing Seminars program. These are roughly the equivalent of the various Freshman English and Expository Writing classes you get at most (all?) colleges. But there are serious differences too, and -- so far as I can tell from my limited perspective as a three-time teacher of one -- the Cornell program is a significant improvement over the usual fare. The major improvement is that the courses are designed around (in their phrase) "writing in the disciplines". That is, rather than simply trying to teach "expository writing" in a sort of general way, or making everyone do English Lit as their writing focus, the courses are taught in areas throughout the curriculum; and the focus is supposed to be how to write in the discipline you're teaching. This recognizes that writing a physics paper, an anthropology essay and a linguistics analysis are very different things. The courses also are each designed around a topic: in theory the class spends half its time analyzing the subject matter and half its time on writing. This means that the students actually have something to write about, also an obvious improvement. Yeah, I know. A program where the specific benefit is teaching in the disciplines, and teaching writing in the disciplines, I, a historian-in-training, offered what was essentially a literature class -- an area in which I have no post-undergraduate training. Of course, we talked about history as well as fiction; but the class was centered around historical novels, and that was the basis of the essays the class wrote. Now, one of the limitations of the First Year Seminar program is that you're only supposed to assign 75 pages of reading per week, to keep the workload manageable (given that they're also supposed to be writing on a weekly (or nearly weekly) basis too). My highly unscientific and rather undersourced impression is that a lot of the seminars don't obey this rule too strictly -- along with the other rules, like how much time is supposed to be spent on writing and how much rewriting is supposed to go on: talking to my students, it seems that a fair number of the seminars break these rules. FWS offered by professors (as opposed to grad students) are particularly bad on this score, and my impression is that a lot of professors just treat them like, well, any other seminar. It's in the way of things that professors are less monitored in this regard, I suppose. Fortunately, 2/3 of the FWS are offered by grad students, so most first-years (who take one each semester of their first year) will take at least one that, y'know, focuses on writing. At any rate, I felt compelled to follow the guidelines fairly closely, and did so. Of course this meant that I could only assign a fairly small number of novels -- four, in the end, chosen for comparative brevity among other factors. (The students also each read an additional book for their long final essay, which doesn't count in the 75-page tally.) Now, keeping a discussion going about a single novel for three weeks -- which is what this turned out to mean -- was a bit tricky. I had to pick novels that could bear it. (In my experience literature courses usually spend only a week or at most two on a single novel, unless it's something both huge and complex such as Ulysses or In Search of Lost Time.) I think I did pretty well on that score if I do say so myself, but it was definitely one of the challenges I faced. So I picked four novels. My understanding of "historical novel", incidentally, was a novel which focused strongly on historical events, even if the author had been alive at the time. Many people make it definitional that historical novels are about events the author did not live through. But I was less interested in historical novels as a genre than what it meant to learn history by reading fiction (which a great many people do -- to say nothing of the fact that, in my experience, a surprising number of history classes assign historical novels), and for those purposes novels based on personal experience worked just find. One of the books I picked was a graphic novel. I did this for a number of reasons. The first, and frankly in the end the most naive, was an attempt to appeal to the students -- I figured that kids liked comics, these youngsters had been kids fairly recently (like, six months before) and so that it might appeal to them. Mostly, however, my students hadn't read comics as kids -- in each of my two classes more than half the students had never read a comic before (I took a show of hands and don't recall the exact number, but it was slightly more than half.) Certainly the "appeal to kids" angle was fairly unimportant -- although in each class I also had one or three students who did really like comics, although generally not the sort of comics I was teaching, and were glad to read one, so I suppose it did work for a small subset of each class. A second reason was that graphic novels are a up-and-coming medium, growing in cultural and aesthetic importance almost weekly, and I thought that kids should be exposed to them. A related third reason was that we live in a visual culture, and I thought some visual analysis would be good to throw into the mix. I think these two reasons worked out much better than the first reason. A fourth reason is that it was fun for me. Self-indulgent, yes, but I might offer the defense that if I'm having fun they're more likely to too. But the most important reason by far -- the reason without which I would never have considered it -- is that the graphic novel I chose was and is a genuinely wonderful book, a superb novel (in the sense of being a sustained narrative with well-developed characters and themes), a superb graphic novel and a superb portrait of a historical era. 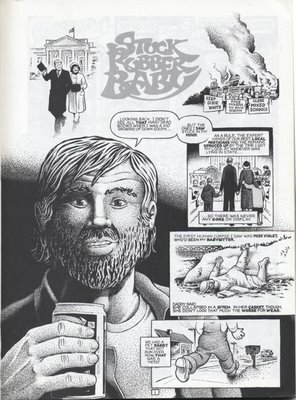 The book I am talking about is one of my favorite graphic novels, Howard Cruse's Stuck Rubber Baby. Howard Cruse grew up in Birmingham, Alabama in the early 60's, at a time when it was one of the centers of the then-at-its-peak Civil Rights Movement. Cruse was white, so saw the events from a different perspective than many histories of the Civil Rights Movement are (though there are exceptions; a splendid recent one is Jason Sokol's There Goes My Everything -- highly recommended.) Cruse was also gay, at a time when the Gay Rights Movement may have started (contrary to popular belief, it didn't begin with the Stonewall Bar riot), but clearly hadn't spread beyond a small handful of still-quite-closeted people -- there certainly is no indication in his semi-autobiographical novel that Cruse had heard of the Mattachine society or anything like it. So Cruse's semi-autobiographical graphic novel (try saying that three times fast) has an interesting and rich perspective on several key aspects of that era of American history. Stuck Rubber Baby takes place in a city called Clayfield, a thinly-fictionalized version of Birmingham, in what Cruse calls "Kennedytime" -- basically, as he admits in his fascinating and detailed web site about the book, between the October Missile Crisis and Kennedy's assassination. * It's lead character is a young, white gay man, sympathetic to the Civil Rights Movement but somewhat clueless about it, as well as a distinct outsider, a man slowly coming to terms with his sexuality at a difficult time for it. But there are lots of very rich characters in the book, black and white, straight and gay -- one of the things that make it such a wonderful novel. It's not a perfect book. Various structural criticisms my students made -- in particular, parts of the story left tantalizingly untold -- seemed fair to me. And I think that Cruse's distinctive but decidedly odd way of drawing people -- what is up with those chins? -- takes some getting used to. But it's a superb graphic novel, a wonderful book, which I recommend quite highly. If you've never read a graphic novel before, it's a pretty good place to start -- which was precisely the situation a lot of my students were in. Here's some things I did in teaching it. The first thing I did was to show my students episode four of the astonishing television documentary Eyes on the Prize -- a superb series, one of the best things ever to air on television, and a very good introduction to the Civil Rights Movement. Even better for my purposes, the history covered in Cruse's graphic novel fit very precisely with the events covered in episode four of the series -- the movement in Birmingham, the 1963 March on Washington, and the bombing of the 16th Street Baptist Church shortly thereafter. This gave my students some historical context to put Cruse's book in, and another version of the events which we could discuss. Then I set about teaching them how to read a graphic novel. A bit of this was really basic, as in, what-order-do-you-read-the-balloons-in basic. For this, I used the (two-page black-and-white educational version of) Jessica Abel's marvelous brief introduction "What is a Graphic Novel?" which introduces students to some of these basics. This was surprisingly necessary: while I, and other comics readers, tend to think of these things as as natural as reading prose, they turn out to be, well, as natural as reading prose, i.e. highly artificial, not natural at all, and a skill which one needs to be taught -- and not a skill that was included in the standard how-to-read-prose educational package. Now, it wasn't a hard skill to acquire -- most of them were familiar with comics if only from the funny pages, and a few minutes in class did the trick I think -- but it did need a little attention. The harder part was teaching them how to read graphic novels in the literary sense of "read" as "analyze". This I did in two parts. And we talked about it. Why were the upper two images without panel boarders? What did they do as opening images? When were they set, anyway? What effect did it have to draw the narrator so large? Or shown at his present-day age? Holding a beer? Why did none of the three images on the left show a human face? What was the effect of this truncation? How would they describe the layout of the page as a whole? Why was the background of the lower half of the page black and the upper half white? And so forth. We then had similar conversations about several other pages in the graphic novel, until they began to get the point that they had to read the images as well as read the words -- indeed, that the images and the words were a single thing -- a comic -- and not two separate, separable things which stood on their own. That was our first full class on Cruse's graphic novel (we'd done a few minutes on how to read a comic the week before they even began reading it.) In our second class on the book I did the second part of my how-to-think-about-comics lesson, which nicely coincided with the FWS mandate of using lots of writing, including in-class writing. This was as follows. I gave them a list of possible pages -- focusing on slightly difficult ones, and ones from the first third of the book, which was all they had read -- and asked them to "translate" that page into what they imagined it would sound like if it had been from a prose novel. The point of this exercise was how hard it was to do it. Not only did they have to pick a style, decide whether it was in the first person (an older version of the narrator does narrate the graphic novel) or third (looking at things happen in a graphic novel creates a decidedly third-person feel for a lot of people), but they had to translate many very specifically visual effects into purely linguistic ones. They quality of their versions varied, of course, but that wasn't really the point: the point was that they had another chance to notice how much was going on visually -- in the pictures, in the lettering, in the layout, etc, etc. Simply copying out the dialogue got them nowhere, or nowhere very good. And after that, we could just talk about the book as a piece of historical fiction: how it portrayed the Civil Rights Movement, how it portrayed the lives of gays (and to a lesser extent lesbians) at a time before the Gay Rights Movement was widespread, how we dealt theoretically with the fact that, while this novel was based on real events, it was also set in a fictional city, and so on. I had them look at Cruse's web page, to see the ways in which the book was and was not based on real events, as well as the research that had gone into the book -- both its events and its visual construction. (He did a lot of research even though he'd lived through the events (or ought one to say very similar events?)) And finally they wrote essays (as they did about each of the novels we read) about the relationship between the personal stories and the larger historical forces as portrayed in the book -- how each affected the other, how historical choices and events were shaped by individual circumstances, and vice-versa. It was fun -- certainly for me, and I think for them. I believe they learned a lot -- about gay life in the 1960's, about the Civil Rights Movement, and about how to read graphic novels. I certainly learned a lot about how to teach graphic novels. As someone who primarily teaches history, I have (alas!) limited opportunities to work fiction of any sort into my classes, let alone specifically graphic novels. But I think I learned a fair bit about how to do it. And, more-or-less out of nowhere, it occurred to me today that I might try and share some of what I learned with you. And if anyone out there hasn't read Stuck Rubber Baby, let me say, once again, that it is a simply splendid book, one I recommend very highly to one and all. A comics-oriented-but-otherwise-unrelated bulletin: Scott McCloud's promised online supplement to his most recent book (which I previously wrote about here and here), "chapter five-and-a-half", is now online. Later Update: I was cheeky enough to send a link to this entry to Howard Cruse himself; he not only read it, but in fact discussed it on his own blog! Click through to read what he has to say. Still Later Update: I have written another lengthy post about Stuck Rubber Baby; if you liked this one, check it out -- I think there's fairly little overlap, considering. One challenge in constructing my chronology was to dodge the two big events of 1962-63: the Cuban Missile Crisis and the assassination of President John Kennedy. Neither of these national traumas had any relevance to the themes of my novel, but by virtue of their historic importance they would have required strong responses from my characters, which means that precious pages would have been drained from my story. So I constructed the pivotal incidents in Stuck Rubber Baby so that they could all occur between the Cuban crisis and the assassination (except for the final scene, which leapfrogged over Kennedy's death by several months). This is, I think, probably a common problem in creating narratives with any sort of real-life connection at all; I recall a character in Nabokov's novel The Defense wrestling with a similar problem vis-à-vis the Russian Revolution, for example. I am teaching a "guided research paper" class, and the topic can be anything I want: I have decided to teach a class on Kill Bill: everyone will research the history of a genre that appears in the film (the Western, the Samurai film and so on) and then explain how it feeds into Kill Bill, which I will lecture on. What the hell are colleges going to look like when guys like you and me run the place? Awesome, is the answer. I considered Planetary and Samurai Jack -- but Kill Bill seemed like the best way to go. Is This Man Worth Two Presidents?